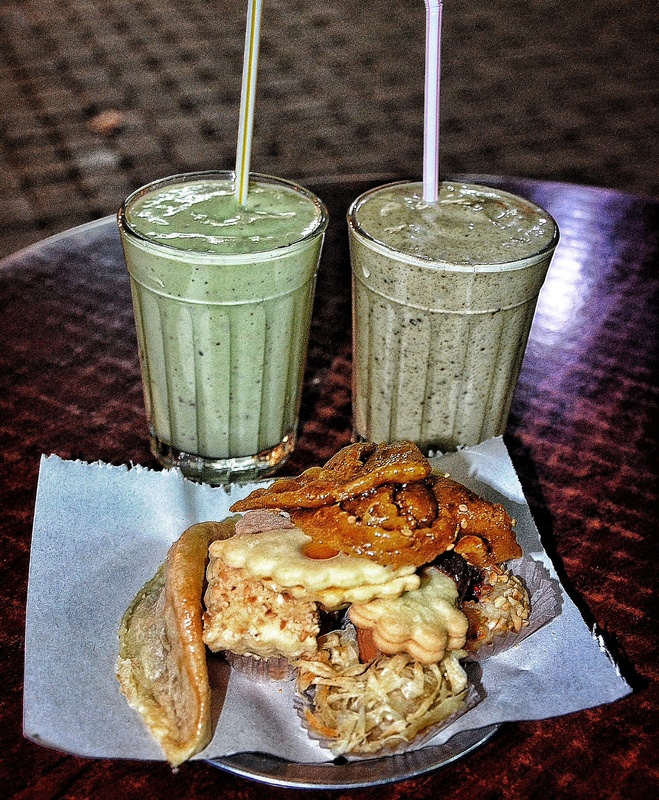 Sampling the Best Moroccan Cuisine with Marrakech Food Tours – Why Waste Annual Leave? Almost as soon as Pumpkin let the cat out of the bag about where he was taking me as a surprise birthday trip this year, I was dreaming of the food. I knew of scorching tagines where tender lamb is cooked to perfection at a pace so languid it leaves you aging during its creation. 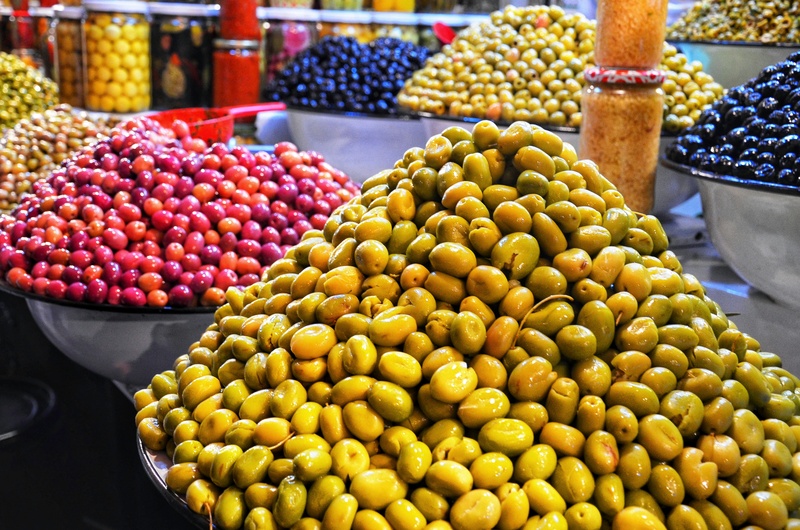 I knew of the plump and succulent Moroccan olives strewn affectionately into this literal culinary melting pot, which glaze this classic Moroccan dish with a sharp pervasive filter. I knew of the fine couscous grains that assume a new life as they sponge the excesses of the inviting aromas. But this was all I knew about Moroccan cuisine, about the history of their mouthwatering meals and about the way they are prepared. 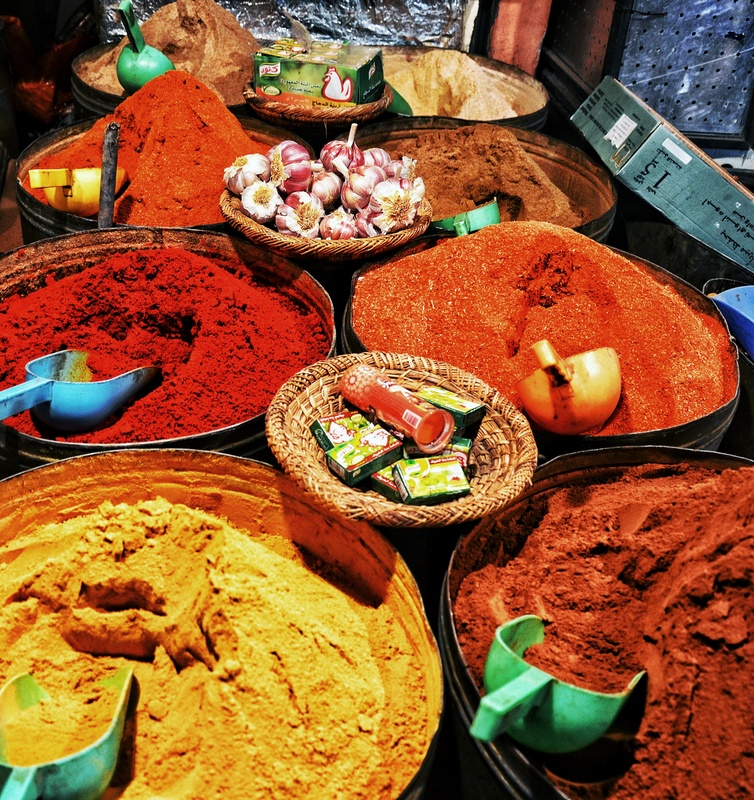 After previously trying out a daytime food walk in London and a Friday night food tour in Ljubljana, Pumpkin told me he had booked us onto the hottest foodie ticket in town at Marrakech Food Tours. And so we arrived at the electric Jemma El-Fnaa square as the sun was starting to retire for the day. The crowds, which I was soon to learn pour in boundlessly, were starting to line the corners of the square but we managed to spot the handful of fellow, food-fiends huddled together, chatting away to the charming couple Amanda and Youssef, who engineered this fabulous tour and personally lead the tours. Rather unfortunately, my overactive thumb has since made the onerous blunder of deleting all the Marrakech photographs that were tucked away neatly in their own folder on my phone. I still have the pictures from my camera and it has taken numerous episodes of me telling myself to keep things in perspective to avoid having a full blown hissy fit about it but apologies for not being able to offer even more photos. Tagines are commonplace throughout Morocco but the Tanjir on the other hand is a local Marrakech specialty, cooked in this deep underground oven and when I say oven, I mean a hole in the ground. Historically, these underground spaces were heated up by the leftover ashes from traditional Hammam spas. Vegetarians may wish to pause reading now… The entire sheep meat is suspended into this heated underground oven and cooked tentatively for hours. We were served both the lamb that is placed straight in the “oven”, cooked with no seasoning and served with just a lacing of cumin salt. There’s no cutlery here so you pick up the lamb with a husk of bread and away you go. To compare and contrast, we were served a second lamb dish, cooked in a similar oven but this time placed inside a clay pot for cooking with more of a citrusy flavour. Opinions were divided as they were both tantalising but I definitely preferred the first. And speaking of underground ovens, we found that these were not used just for meat. 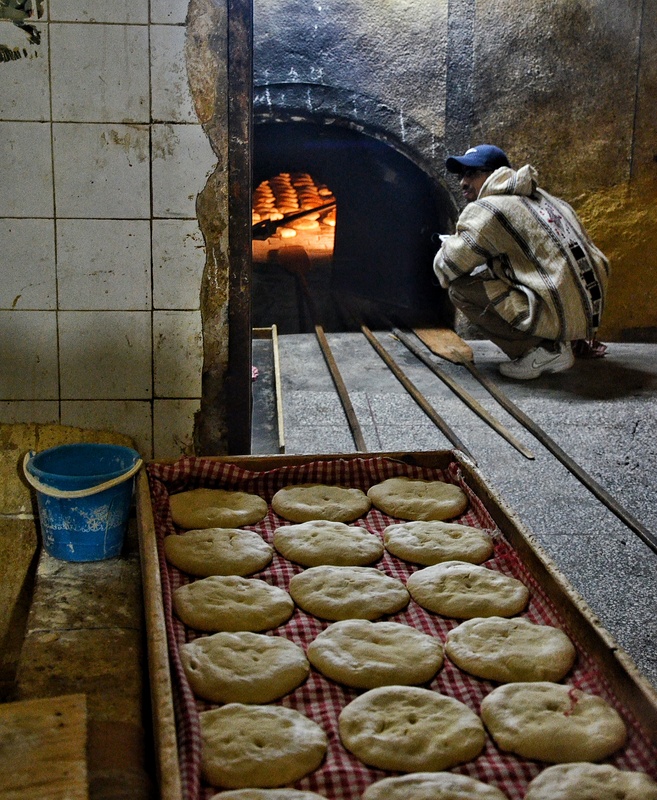 The aforementioned husks of breads are cooked right underneath our feet with children often being given handmade dough from their mothers to drop into these ovens on their way to school. Each individual cooked piece of bread is then returned to its rightful owner at the time of collection. Goodness knows how they keep tabs on whose is whose? Before progressing to the second dish of the night (we had no idea just how much food was to come),we paused to get a fix of olives at this vibrant market stall. Just take your pick between the mild and fragrant green ones, the salty black ones or the spicy harissa olives. 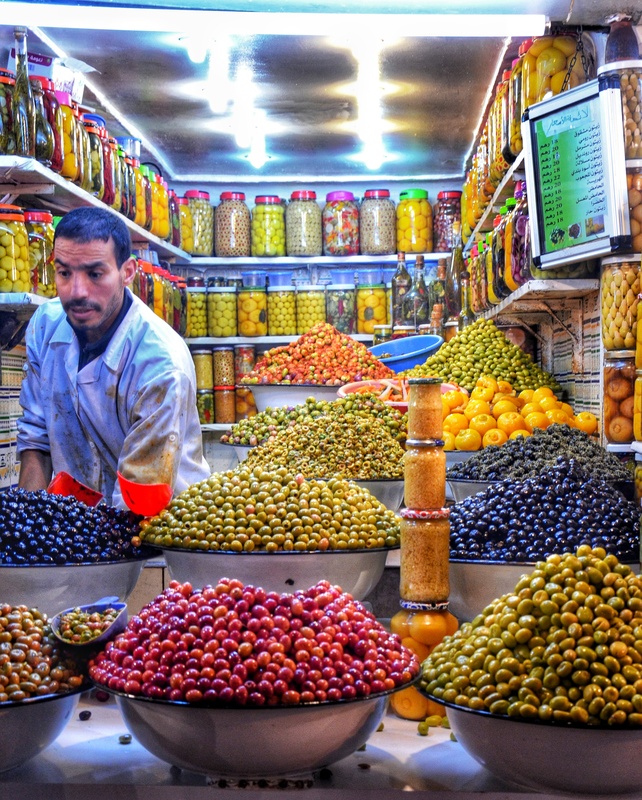 I hadn’t realised that Morocco is one of the world’s biggest exporters for olives. Now I must admit, when I was told we were stopping for a sardine dish next, I thought about doing a runner. I’m not a fussy lady – there are only about four ingredients that I actually dislike and sardines (I thought) were one of them. But fortunately for me, the sardines here are reincarnated into a fresh and filling sandwich, made up of ground sardine served inside hearty Moroccan bread with fresh onions and olives. I’ll admit it sounded utterly bizarre and I half expected to force it down with a polite smile on my face but I absolutely loved this dish! It was one of my highlights of the night and nearly all of our group agreed that with the exception of a hint of salty aftertaste, you’d never even know there was sardine in it! Another reason that I love food tours like this is because it gives you the security and confidence to venture into eateries that you may perhaps be too apprehensive to attempt just like this sardine sandwich cafe. 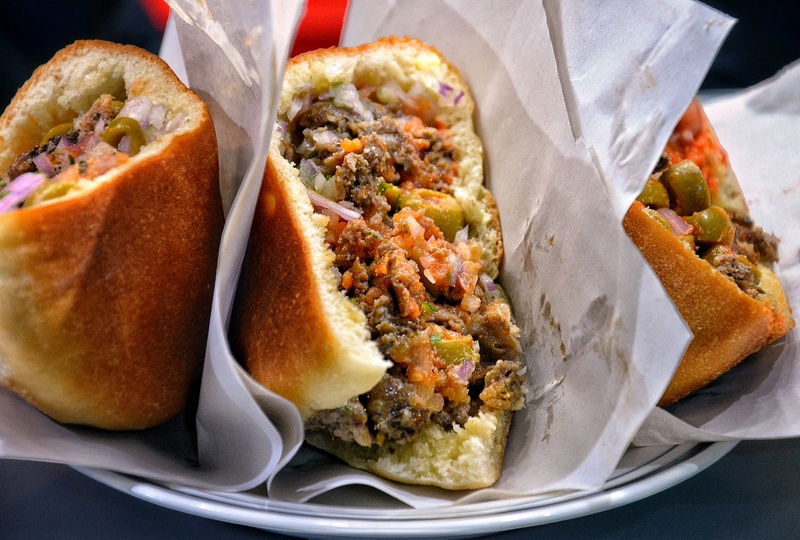 The numerous episodes of gastroenteritis I had as a child visiting India left me with a bit of a phobia of eating street foods abroad but with some delicious snacks in Rio last year, I finally started to overcome that. There’s a strong misconception that if a restaurant looks posh and glamorous, it equates with good hygiene standards. Amanada and Youssef believe that the best Moroccan cuisine cannot be found in tourist squares or hotels but rather in the depths of family kitchens across the country, being made by the hardened biceps of mothers and grandmothers, who have been cooking for generations. 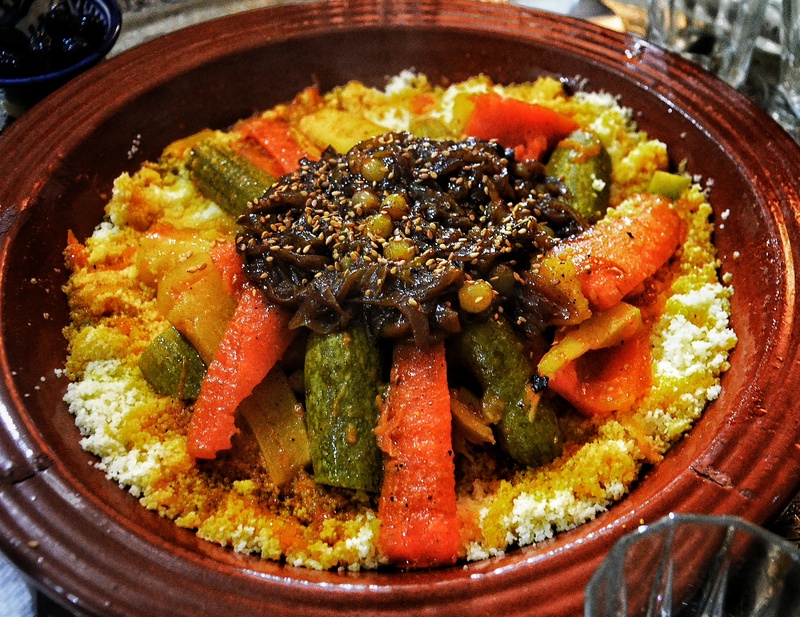 Prior to choosing a couscous dish for the tour, they sampled numerous restaurants before they found a Grandmother who was doing just that in the heart of Marrakech, a city where most restaurant kitchens are staffed by men. By now, I had crossed from being pleasantly full to bursting out of my jeans but fortunately, the desserts were in small bites and were predominantly almond-flavoured biscuity treats but after those savoury dishes, it was hard for anything to compete. The avocado and date smoothie, however, was a pairing of flavours I had never tried before but worked well together and felt nutritious enough to somewhat appease my guilt about an evening of foodie indulgence! 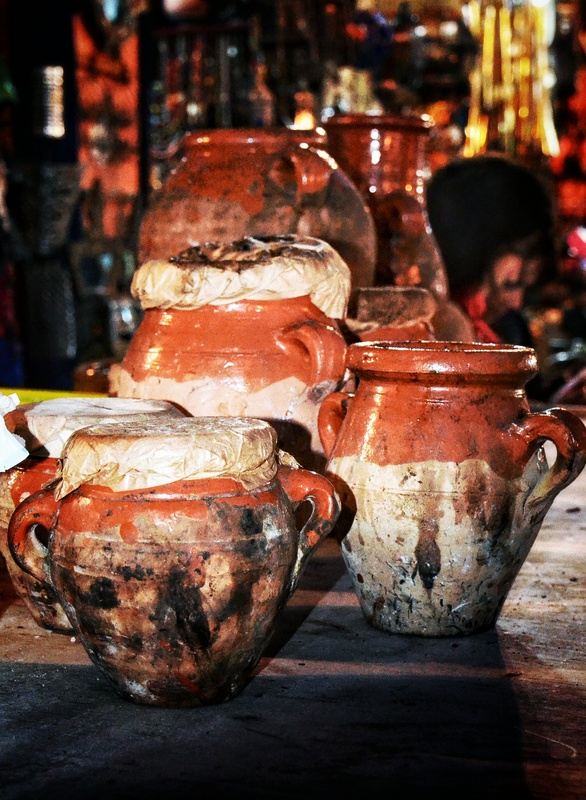 I would highly recommend an evening with Marrakech Food Tours for a unique way to discover the best Moroccan cuisine and to uncover the tales and treasures behind it. Have you visited Morocco? What did you make of the cuisine? Oh it looks so colourful! I’ve never visited Morocco – and after a bad experience in Egypt I’ve been put off North Africa but I think I will venture back eventually, especially if the food looks this good! Oh no Keri, I’m so sorry to hear you had a bad experience in Africa. I think it’s quite hard afterwards to go back to the same region without feeling a little apprehensive so I can empathise with that. 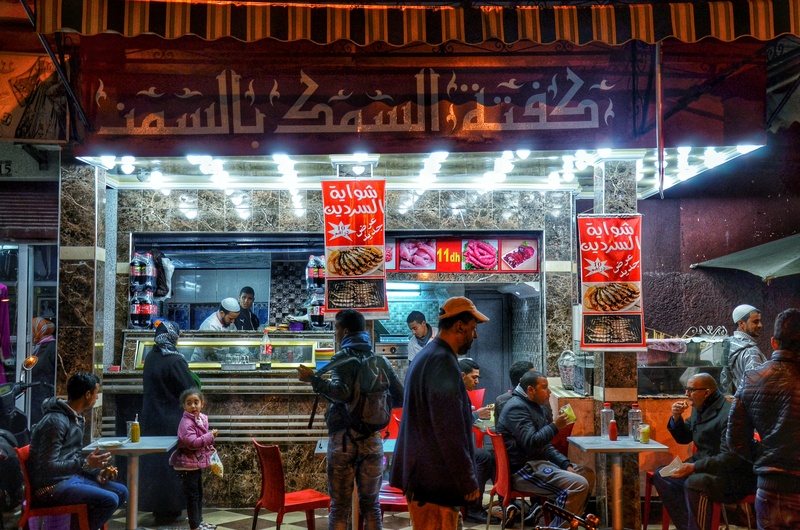 There were things I bothy liked and disliked about Marrakech as a city but the food is undeniably delicious out there! Aaaagh Emma, I wish I’d told you too – so silly of me as I think you would have quite liked this! I highly recommend it if you do go though. Such a great way to learn more about the city and its foodie traditions! tell as it all just goes in with the other fillings and they work so well together! Oh thank you Suze! Yes I was very cross with myself for being careless but still had quite a few on the camera so it wasn’t so bad I suppose! It sounds delicious and looks so colourful. Love the idea of the sardine sandwich! I’ve accidently deleted photos more than once – so frustrating – but your phone pics are still great. Thanks Suzanne! I was so frustrated when it happened but at least I still had some pjoyid so just had to keep it in perspective! The tour itself was fantastic and they most be miracle workers as o never imagined I’d ever be plugging a sardine sandwich but it was so delicious! My wife and I spent a week in Marrakech as part of our honeymoon at the beginning of May. We found this tour and booked from the UK before leaving. Youssef was an excellent and most accommodating host. Shame we never met Amanda. 24 hours previously our first visit to the the main square and the souks had felt a little overwhelming. With Youssef we quickly felt relaxed and ready to enjoy a most memorable night. We visited locations that we would never have found , or simply passed by, each revealing it’s own unique food treasure. This was certainly an experience I look forward to repeating. Hehe, I think what you should do is just book the flights and then address the telling off later (though don’t tell Alex I said so!!) I was quite disappointed when I realised that I’d deleted that album but like you say, I just kept reminding myself that I was lucky to still have some ☺ If you do go, I’d definitely recommend trying out this tour – it was so unique especially visiting things like the underground bread oven and seeing how the most delicious lamb can be made just in that hole in the ground style of cooking! I absolutely love dates too Anna!! The smoothie was quite filling so I only wish I’d been hungrier when I tried it but the combination of flavours worked so well together! And I was really impressed that they managed to make me revise my opinion of sardines I know you love uncovering the foodie secrets of a place and if you ever head to Marrakech, I think this type of experience would be right up your street! I love the idea of the children having their own individual breads! Moroccan food is great, but I was sick of sardines after a week on the Northern Coast. haha. Hahaha, wow Ok seriously, I liked this sandwich but there’s no way I’d be able to manage a whole week of sardines so credit to you Katie!! I only went on my first food tour last year and seriously can’t believe I hadn’t discovered them sooner as they are such a great way to learn about and eat your way through some of the best food in a city! I was quite surprised at just how nice the sardine sandwich was as I too normally don’t eat them. I have a real obsession with Moroccan food! 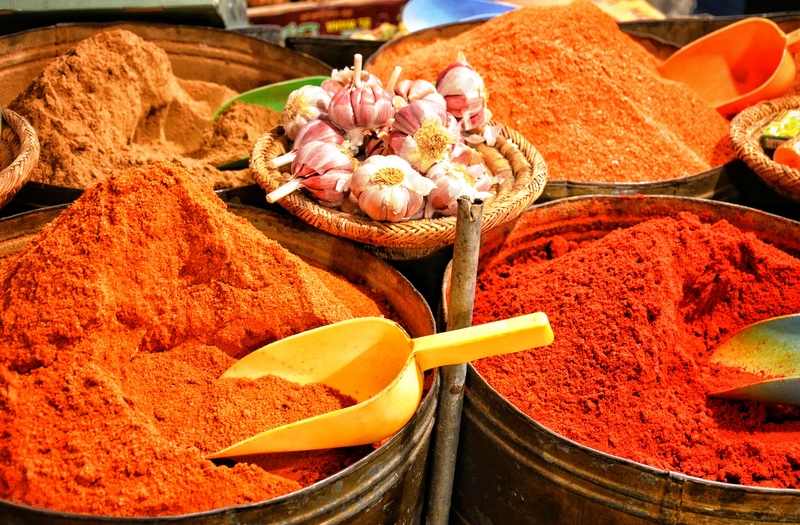 First time I went I didn’t know what to expect at all but it’s so good – I did a cookery course in Essaouira last year so can whip up a decent tagine now! Oh how lovely Lucy! I want to learn too as I loved the food out there. I really enjoyed the way they fuse so many nuts and dried fruit and sweet flavours into savoury dishes – makes for some really interesting meals! So many delicious food in one post! 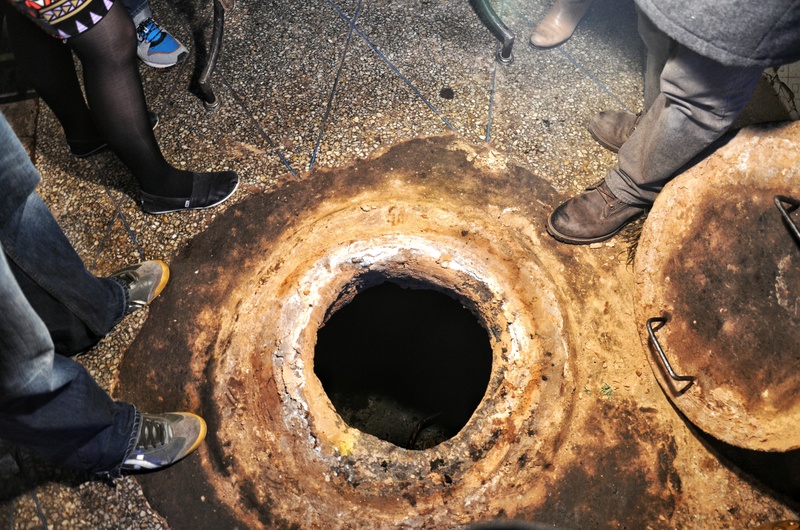 I loved the first dish, what an interesting thing it is this oven in a hole, I have never seen something like this before. I can only imagine how delicious the meat was. Yummy post! You always make me want to book a trip to Morocco! hahaha my mother on the other hand, can spend the entire day eating olives! Pingback: Finding the Best Cicchetti in Venice on a Food Walking Tour | Why Waste Annual Leave?